Dishwasher detergents like Cascade® with Clorox® use chlorine bleach—a viciously toxic substance—to get your dishes clean. When you use it not only is chlorine bleach spraying every plate, glass, cup, and piece of silverware your family will use at their next meal, but as your dishwasher runs through its cycles the fumes from the chlorine bleach drift out of the vents, tainting the very air your family breathes! This is especially bad because a recent study based on 20 years of research reveals that cleaning your home with common, well-known grocery store brand cleaning products significantly damages lung tissue in women. In fact, the study showed that cleaning with such products as little as once per week over time is as damaging to respiratory health as smoking a pack of cigarettes a day for 20 years! For generations dishwasher detergents used phosphates to soften the water. But after phosphates soften the water, they rinse into our waterways and disrupt our aquatic ecosystem! Thank goodness for Diamond Brite! Diamond Brite is free of phosphates and chlorine bleach. It’s also made with 100% nontoxic ingredients—because what’s on your dishes can also go into your body. Instead of harmful phosphates, Diamond Brite uses a plant-derived water-softening agent. In place of chlorine bleach, Diamond Brite uses natural enzymes to break down food soils and stains stuck on dishes so they can be easily washed away. Not even burnt-on, baked-on, dried messes are a match for Mother Nature’s natural food removers! They work so thoroughly and efficiently you don’t even have to rinse the dishes first—just remove large food particles and put the dishes in the dishwasher. 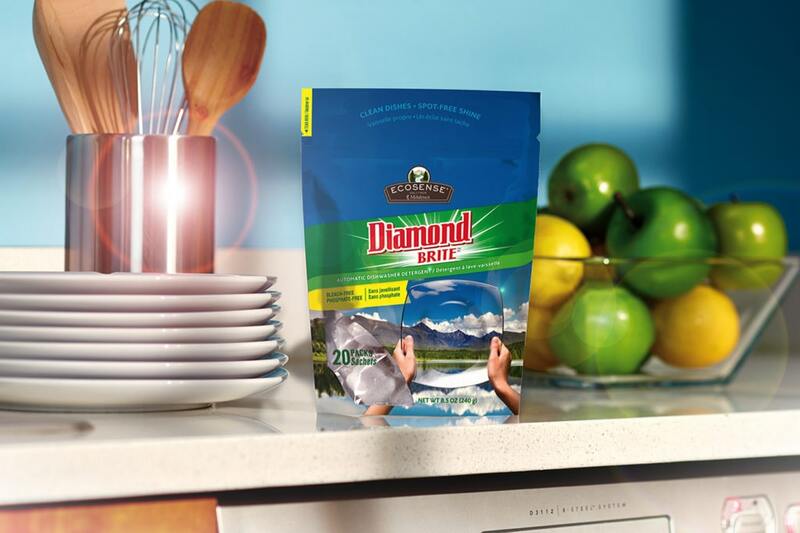 When you open your dishwasher after all cycles are complete, one look at the freshly cleaned dishes will tell you how Diamond Brite got its name. Everything will sparkle with that wonderful, spot-free shine! Diamond Brite contains no harsh chemicals. It’s pH-neutral and as non-caustic as tap water. Diamond Brite Gel doesn’t even need a childproof cap! You’ll be amazed at the results you get with Diamond Brite. And by choosing an effective formula free of chlorine bleach and phosphates, you will have a conscience as clean as your dishes.